Navy is a classic color but often overlooked. I have less than a handful of navy items in my closet. It's a very versatile color that can be paired with most neutrals as well as prints/patterns. For this outfit, I paired this navy colored tee with my trusted floral skirt and am loving the end result. I like how the subtle grid pattern makes a tee less boring. This tee is from a brand called JOA via Adela Mei. Adela Mei is an online boutique dedicated to petite fashion. If you're 5'4" and under, I highly recommend you check them out. Adela Mei is hosting an #AdelaMeiPetite Instagram contest right now. All participants will receive a $20 gift code to spend online. Click here to see how you can enter. You look amazing. 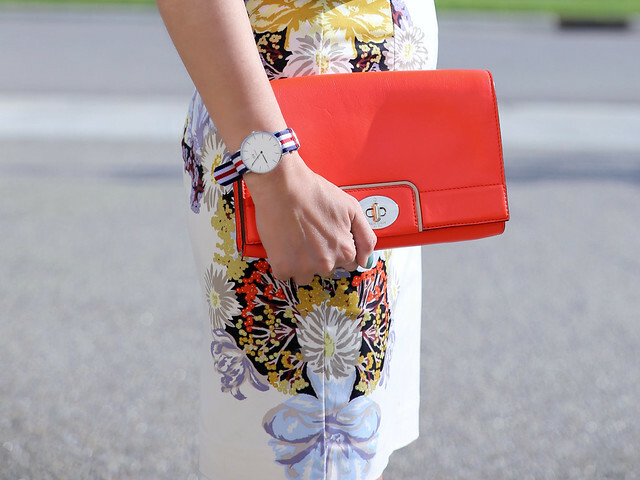 Love the navy and orange and the printed skirt is perfect. I am so smitten with this navy and coral combo. That skirt is beautiful. This is such a lovely look! !